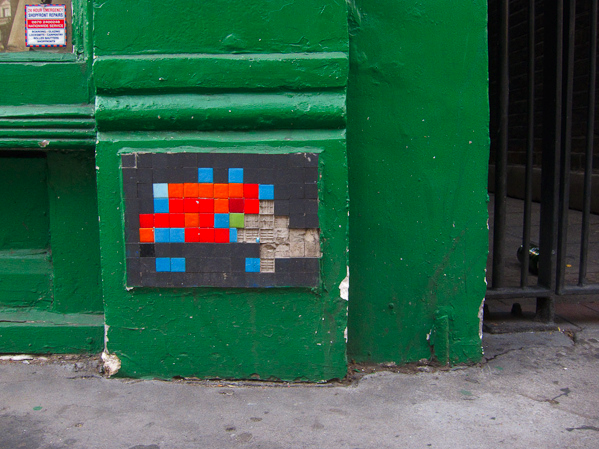 The other weekend I went on a reccy round Soho to find a few Space Invaders I’d not seen. Oh, and to check out the new tyres on my bike as well. It’s amazing how easy a bike is to ride with new, fully inflated tyres, especially when central London is nice and quiet. You can see the full set of photos from that day here, a total of 14 invaders – unfortunately six of which were already destroyed – another lesson to get out and about and see any invasions in your neighbourhood before its too late. In related news, Invader has a newsletter out right now, which mentions some new prints at Pictures on Walls in July, and a new, official invasion in San Diego and a full ‘Invader Walk’. Check out the trailer here.